An inspiring true story of a 9/11 hero about making a difference through our actions, told by New York Times bestselling author Tom Rinaldi. Welles Crowther did not see himself as hero. He was just an ordinary kid who played sports, volunteered at his local fire department, and eventually headed off to college and then Wall Street to start a career. Throughout it all, he always kept a red bandanna in his pocket, a gift from his father. On September 11, 2001, Welles was working on the 104th floor of the South Tower of the World Trade Center when the Twin Towers were attacked. That day, Welles made a fearless choice and in doing so, saved many lives. The survivors didn’t know his name, but one of them remembered a single detail clearly: the man was wearing a red bandanna. Welles Crowther was a hero. 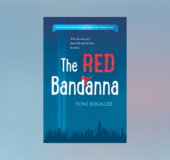 Award-winning ESPN reporter Tom Rinaldi brings Welles's inspirational story of selflessness and compassion to life in this accessible young readers’ adaptation of his New York Times bestselling book. This powerful story of making a difference through our actions is perfect for helping the post-9/11 generation understand the meaning of this historic day through the eyes of one young man.